February 2018, an interesting month. The club had two events on in February both of which were interesting/memorable for two very different reasons. 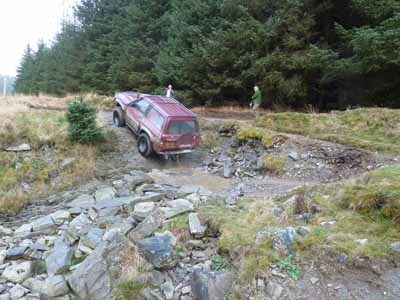 The first event was Skills Development day and the second event was a laning trip organized by Andy which finished a lot later than planned (about 6.30pm or later). The skills development day was very much a one man effort with a lot of the ideas and planning coming from Keith Richards. Not sure why, but it was decided we had to use or could only use Roundhill Woods. For those of you not familiar with Roundhill Woods it mainly consists of lots of bomb holes, some with quite steep sides and quite flinty and not much variety. So perhaps not the best site but what really shocked us when Keith and his helpers went along on the Saturday to lay out the sections and try out some of his ideas was the state of the site. It soon became obvious that a club or group of people had been along recently and really torn the place up. What ruts where there had got a lot deeper and people had obviously been playing in the challenging holes/sections purely to get stuck in and in doing so just made sections of the site inaccessible to the average club member. 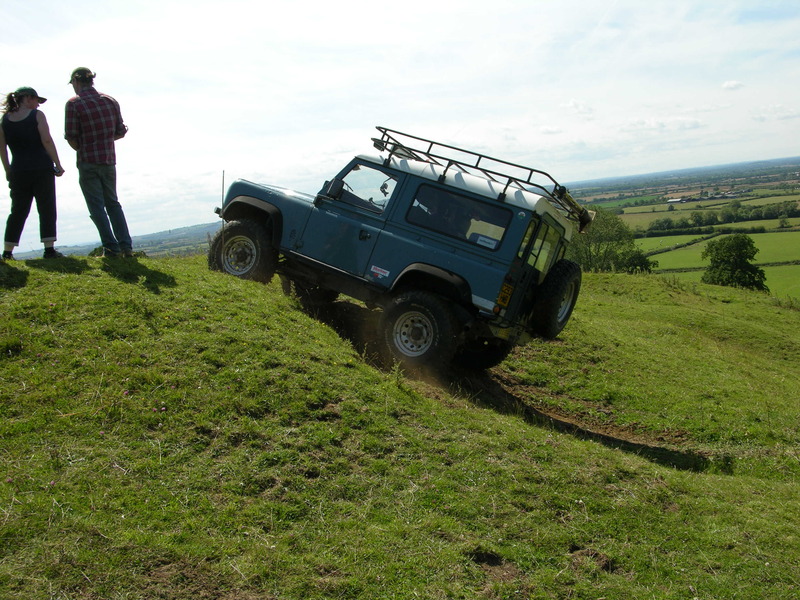 We found out the next day from Martin Lewis who is the chairman of AROC that Burnham Offroaders book the site two years in advance and use the site every 4 to 6 weeks for pay and play and other activities. After spending most of the day trying and practicing Keiths mad/interesting ideas we decided to leave about 3ish not knowing what sort of numbers would turn up the next day but I would say that a lot of us had ideas on what we could do to improve or build on Keiths initial ideas. Keith Lister took a lot of pictures and kindly volunteered to do a write up about the next days event. It was a miserable cold & damp day on Saturday when we met Keith Richards at Roundhill woods to set up some tasks he had thought of for the members to test their skills on the Sunday. First we chose an area to create a 4×4 football run with a goal and a giant inflatable ball. This proved quite a difficult task as the ball was very light and kept blowing off course and it was about half the size it needed to be as it kept getting squashed under the front of the vehicles. Eventually Keith came up with a larger ball which worked reasonably well apart from still being too light. On Sunday after all the drizzle from Saturday the course was very slippery and people were struggling to control the vehicles let alone the ball. Unfortuneately Andy Collins slid into a tree and broke a rear side glass in his Jeep. Eventually and not unexpectedly the ball was punctured. With a repair being made with gaffer tape and not so much pressure in the ball it was put on the bonnet of a vehicle, driven around the course and a goal scored when stopping abruptly to make the ball roll off the bonnet into the goal. 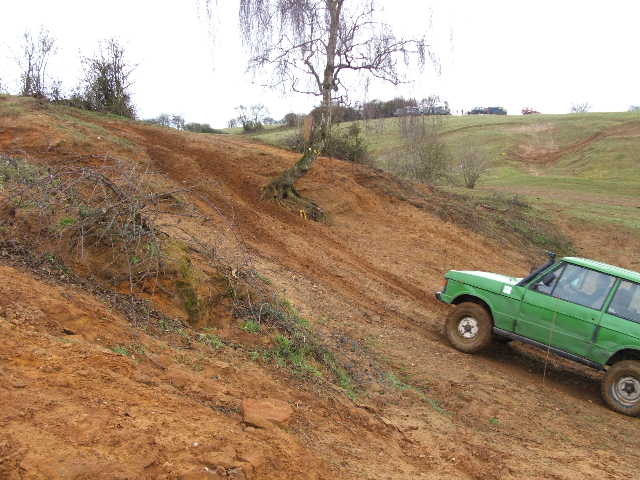 Close by the football task was a small pond or large puddle for 4×4 owners, which was set up to guide the ball with the vehicle through a 90deg course. I watched Maddy & James tackle this as a two man (sorry Maddy) team with James pushing the ball from Maddy’s right towards Maddy so she could then push the ball in a forward direction to complete the course. The point of the event was to create tasks which would encourage a team effort by members. There were enough people on Sunday to have two teams running round at the same time. Here the task was to self recover a vehicle and then assist winching the rest of the group through the ravine. A suitably large tree was used to secure the winch cable to using a tree strop then winching out of the ravine. The first vehicle then turned round and secured itself to the said tree so as it could then winch the other members through the ravine. The next task was probably the most fun for the guys. As you can see a bucket filled with water was suspended on a rope fixed between two vehicles. The rope having a weaker link in it meant care had to be taken not to make the rope too tight or the link would break. The idea was to transport the bucket through the course without spilling the water or breaking the rope. Refilling the bucket was not against the rules but a few other liberties were taken. 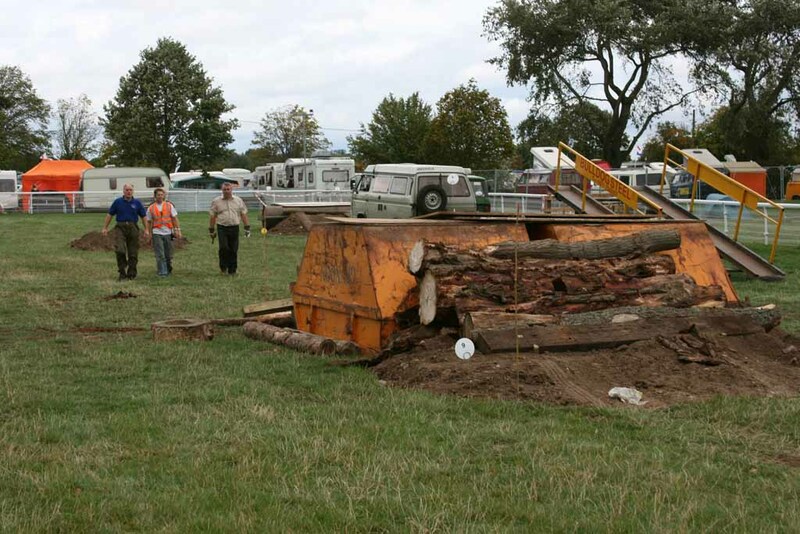 Again the breakable link was incorporated in this task of connecting three vehicles together and then negotiating a course without breaking the link, it was broken a few times but they eventually got round the course.